126 for it reviveth the stomach and heart strengthneth the back procureth appetite and digestion driveth away melancholly sadness and heaviness of the heart. 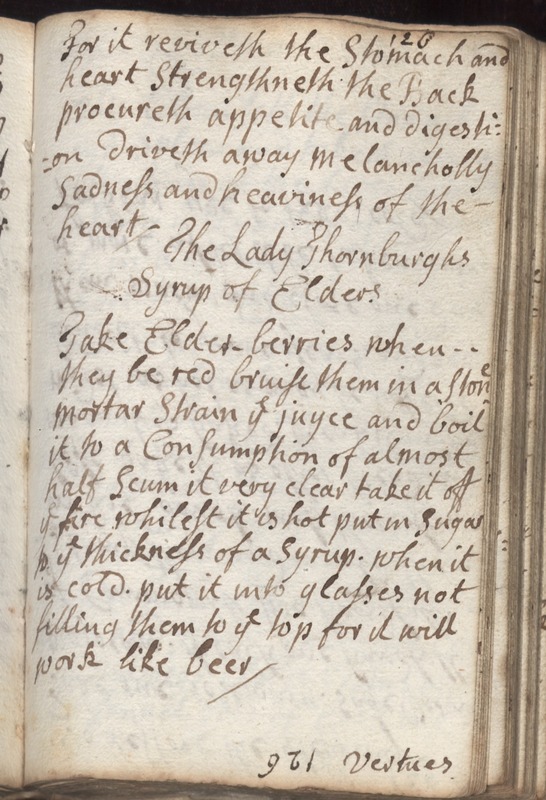 The Lady Thornburghs Syrup of Elders Take Elder-berries when they be red bruise them in a stone mortar strain ye juyce and boil it to a consumption of almost half scum it very clear take it off ye fire whilest it is hot put in sugar to ye thickness of a syrup. When it is cold, put it into glasses not filling them to ye top for it will work like beer.